Our beautiful Icon Student Spaces apartments in St. Louis, MO are a convenient place to live, and we understand that living does leave its mark. That’s why this month we have some time-saving tips for deep cleaning your apartment. Make it a goal to finish a deep clean of your apartment before the summer is through. Then reward yourself for a job well done! Cleaning doesn’t have to be a daunting task if you make it manageable. If it helps your motivation to keep going once you see a finished room, clean one room at a time. Doing so will also mean that even if you don’t finish your entire apartment over the weekend, you still have at least one room to show for your effort. Cleaning one room specifically will also help you focus on the type of cleaning that you need to do, which can help you stay organized and clean efficiently. You don’t have to clean your whole apartment in one day, unless you really want to (and can). Split up your tasks (possibly room by room!) and focus on one big thing each weekend. That will give you more time to dedicate to your chores, so you will be able to know you’re doing the type of quality job your apartment deserves. Plus, if you plan on only cleaning the kitchen one week, you won’t have to feel guilty for not getting to the living room. This will give you renewed energy for your next chore next week. Along those lines, try cleaning the rooms you’re most intimidated by at the beginning of the month so you can get them out of the way and so you can have something to look forward to after a busy afternoon of deep cleaning. Deep cleaning is called deep cleaning because it’s a chore that lets you focus on the things you otherwise overlook. These can include the grout in your bathroom, the spills on the shelves in the refrigerator, the sheets and pillowcases on your bed, or the baseboards around your whole apartment. By themselves, they’re quite easy to clean. 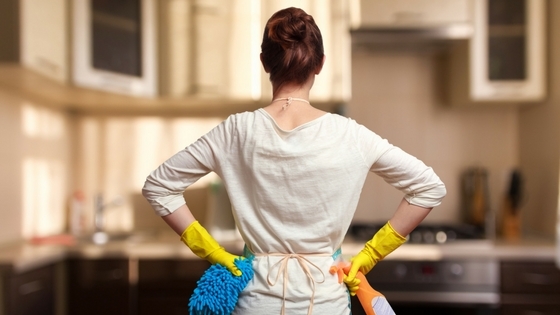 Make them a simple part of your cleaning process by including them in your schedule each week. Check out this slideshow for deep cleaning the bathroom, this article for deep cleaning your fridge, and these 10 graphs that will make you a pro at cleaning anything if you want some specific guidance on when (and how) to clean these details. If you have roommates, family members, or friends who are willing to help you clean your apartment, use their help! Assign out tasks so that each person has a few things to do. Remember, many hands make light work! Good luck cleaning your apartment this month! We hope these suggestions and resources help you have a successful time cleaning.